This generally refers to the net mesh size. Mesh sizes are selective. A larger mesh catches larger fish, and a small mesh captures smaller fish. Smaller fish can swim, or struggle, through larger mesh. Large salmon less likely to be gilled in the small mesh net. 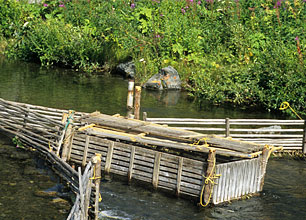 Restricting net mesh to smaller sizes allows a greater portion of the largest salmon to successfully migrate to spawning grounds. These include the large, egg-rich females. However, there is a concern that the salmon most likely to be captured in any regulated net size will be selectively removed from the spawning population.